Namibia is a country in South West Africa that borders Angola, Zambia, Botswana and South Africa to the South. It has a significant coastline to its west looking out on to the South Atlantic Ocean which offers it many advantages over its surrounding landlocked neighbors. Its gets its name the “Skeleton Coast’ from the washed up whale and seal bones and the ship wreaks that dot the coastline due to rocks and fog. It is one of the least populated countries in the world due to its large amount of desert land. Namibia enjoys a good standard of political, economic and social stability and its economy is closely tied to South Africa because of their shared history. The main industries are agriculture, manufacturing, tourism and mining. The mining industry is significant (accounts for 10+% of the gross domestic product) and includes mining for diamonds and other gems, uranium, gold, silver and base metals. Namibia has a German influence as it was once colonized by Germany and gained its freedom in the 1st World War. German architecture and the German language are still in evidence today. The banking industry is well developed in Namibia and has all the features you would expect to find in 1st world countries such as online banking, phone banking etc. The Bank of Namibia is the main bank but Bank Windhoek, First National Bank, Nedbank and Standard Bank are also available. It is challenging to get a work visa for a foreigner in Namibia as due to a notorious history of high unemployment rates a law was passed in early 2010 announcing that all labor must be sourced, without exception, from within Namibia. The cost of living in Namibia is also relatively high due to the fact that the majority of goods are imported, 4/5th’s of which are from South Africa. The high standard of English and the British schooling influence offers opportunities to investors in the area of call service centers and other industries that require a good level of English. Companies who are based in South Africa should consider outsourcing their call service center employment to Namibia for this reason. Wages in Namibia are lower than those in South Africa and the average wage is approximately US$5,880 per year. Healy Consultants Group PLC have been incorporating companies in Namibia and Africa for over 10 years. Please contact us at for information on the best type of business entity to incorporate. We also provide ancillary services such as bank account opening, office and staff sourcing services. 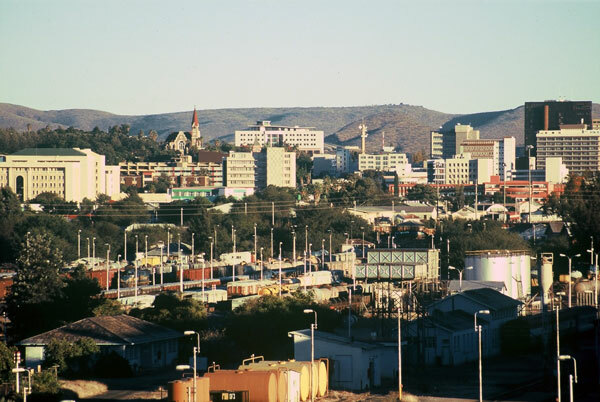 “Windhoek-Skyline” by Bries – Own work. Licensed under CC BY-SA 2.5 via Commons.